Marc shares some of what happened on this day in history, including the bombing of Martin Luther King, Jr.’s home in retaliation for the Montgomery bus boycott, the formation of the Harlem Globetrotters, and Bloody Sunday, the day British Paratroopers opened fire on and killed fourteen unarmed civil rights marchers in Derry, Ireland. EVENTS1649 – King Charles I of England is beheaded. 1661 – Oliver Cromwell, Lord Protector of the Commonwealth of England is ritually executed two years after his death, on the anniversary of the execution of the monarch he himself deposed. 1797 – Boston Masons, led by Prince Hall, established first Black interstate organization, creating lodges in Philadelphia and Providence, Rhode Island. 1835 – In the first assassination attempt against a President of the United States, Richard Lawrence attempts to shoot president Andrew Jackson, but fails and is subdued by a crowd, including several congressmen. 1847 – Yerba Buena, California is renamed San Francisco. 1908 – Mohandas Karamchand Gandhi is released from prison by Jan C. Smuts after being tried and sentenced to 2 months in jail earlier in the month. 1933 – Adolf Hitler is sworn in as Chancellor of Germany. 1945 – World War II: The Wilhelm Gustloff, overfilled with German refugees, sinks in the Baltic Sea after being torpedoed by a Soviet submarine, leading to the deadliest known maritime disaster, killing approximately 9,500 people. 1956 – American civil rights leader Martin Luther King, Jr.’s home is bombed in retaliation for the Montgomery Bus Boycott. 1960 – The African National Party is founded in Chad, through the merger of traditionalist parties. 1961, The Shirelles became the first girl group to have the number one song on the US chart when ‘Will You Love Me Tomorrow?’ reached the top. The song peaked at No.4 in the UK. 1968 – Vietnam War: Tet Offensive launch by forces of the Viet Cong and North Vietnamese Army against South Vietnam, the United States, and their allies.1969 – The Beatles’ last public performance, on the roof of Apple Records in London. The impromptu concert is broken up by the police. 1971 – Carole King’s Tapestry album is released to become the longest charting album by a female solo artist and sell 24 million copies worldwide. 1972 – Bloody Sunday: British Paratroopers open fire on and kill fourteen unarmed civil rights/anti-internment marchers in Derry, the North of Ireland. 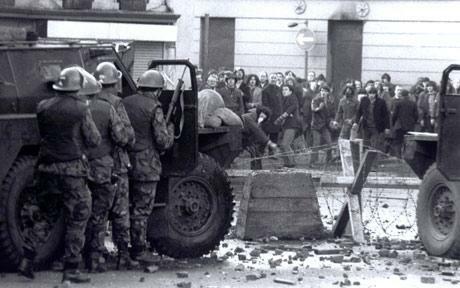 1972 – Paul McCartney wrote and recorded his protest song ‘Give Ireland Back To The Irish’ within 24 hours of Bloody Sunday, when 13 Catholics were killed by British paratroopers. 1995 – Workers from the National Institutes of Health announce the success of clinical trials testing the first preventive treatment for sickle-cell disease. 1928, Born on this day, Ruth Brown, US singer who had the 1957 US No.25 single, ‘Lucky Lips’ and was Atlantic Records top selling artist of the 50’s scoring hits such as ‘Teardrops from My Eyes’ and ‘(Mama) He Treats Your Daughter Mean’. Brown died on November 17, 2006. 1964, Born on this day, Angie Stone, singer, songwriter who was a member of Vertical Hold and is now a solo artist. Stones has written hits for Mary J. Blige & D’Angelo.